Easy 30 minute recipes for weekday cooking - Blog - Great Steak! Sometimes, I just crave a great steak. And lucky for me, my husband Steve is a great steak griller. Steak is our go-to instant meal, since it requires no prep (unless you’re using a less-tender cut and need to marinate it) and no dirty pots or pans. We fire up the grill, put the meat on and dinner’s on the table in no time. Slice leftover steak thinly for sandwiches. Run a clove of garlic through the garlic press and mix with mayonnaise. 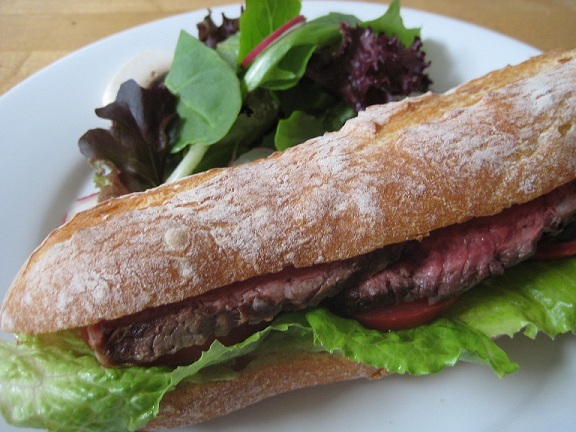 Spread the garlic-mayo on lengths of split and toasted baguette and add lettuce, sliced tomatoes and the steak slices. 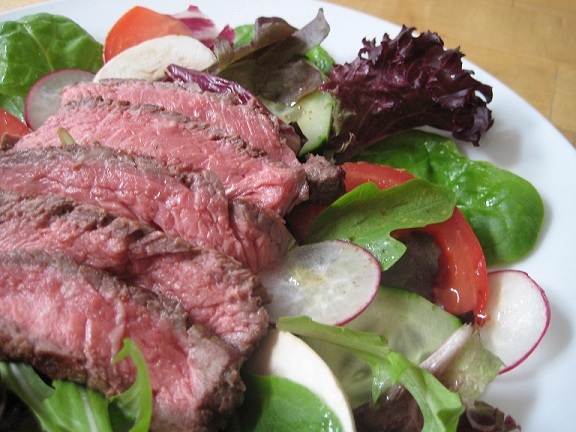 Slice steak and serve on a salad of pre-washed baby greens for a quick and tasty dinner. Add tomato wedges, cucumber slices, sliced mushrooms – whatever veggies you have on hand – and toss with prepared or homemade vinaigrette. Slice steak and wrap in warmed corn tortillas with salsa, sour cream and refried beans. Make mock Vietnamese noodle soup (pho) by heating reduced-sodium chicken broth and seasoning with a little fish sauce. Pour broth over cooked noodles and top with thinly sliced steak. Serve with a plate of raw bean sprouts, sprigs of mint and basil, thinly sliced jalapeno pepper, and lime wedges to add at the soup at the table. Add bits and pieces of leftover steak to fried rice. Once the steak is on the grill, do not move it around until it’s time to turn. Steve likes the book, Timing is Everything, by Jack Piccolo to use as a guideline because, it not only gives grill times for steaks by cut, the author also gives it by thickness of the steak. Steve buys 1-inch-thick ribeye steaks, which take 6 minutes of grilling per side. For appetite appeal, he likes to give his steaks cross-hatch grill marks. To do that, give the steaks a half turn on the grill when halfway cooked on one side (3 minutes for the ribeye) grill 3 more minutes, then flip the steak over and do the same for the second side. Let steak sit for 10 minutes before slicing to keep delicious juices from escaping onto the cutting board.